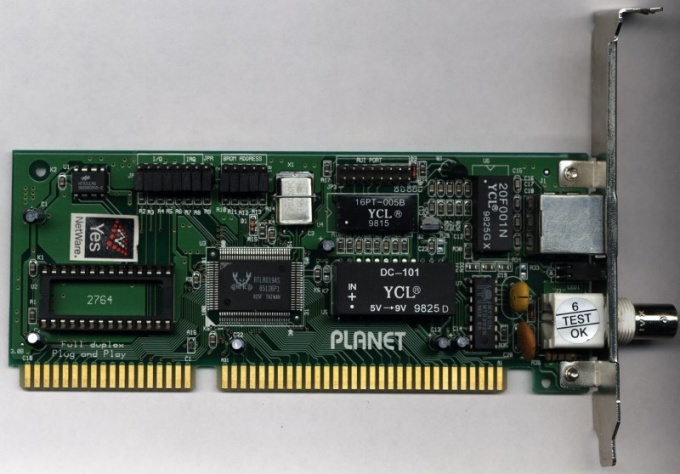 For the computer in the network (including the Internet) require the use of a network card. There are a number of factors that can cause failure of this device. One of the most common variants is a bug in the drivers. To check go to start –> "control Panel" –> "device Manager". Scroll to "Network adapters" and expand it. If the used equipment is an icon of a yellow triangle or a question mark), most likely the problem is the driver for the device. Click right mouse button and select "Update driver software". Next select "Automatic search of drivers". To resolve this problem in another way. Launch your Internet browser and go to the official website of the manufacturer of the network card. Find a page devoted to your model and download drivers. Final after download double click the installation file and wait until the end of the process. The second common reason is turned off the connection. Click "start" –> "control Panel" –> "Network control Center network and sharing"). Find the used network connection. If it is, open its properties and click "Enable". Another cause of malfunction may be a used cable. Remove network card and check for damage. Note on the contacts – it is likely that some of them are broken or depart from the network card slot. If possible test the cable on another device. If everything works, then the problem lies not in this. Swage the cable used is also one of the reasons for failure. If the computer's network card connects to the router, hub, etc., should be made of the direct circuit of the crimping. If there is a connection of one computer with another, the cable should be crimped "on the contrary", according to the scheme of crossover.